The following web application presents the operation of the T. Vh. Re. S3 torpedo calculator used on German U-Boats. The mathematical model of this calculator and its construction is described here and here. The calculator is simulated using described model and the calculation results match with the historical test data, which are published here. The most of the screen is occupied by front panel of the calculator. The interactive elements are marked on the drawing below. In the upper-right corner is located the panel with two sliders. They allow to set the current periscope bearing and current main rudder deflection. Below this panel, at right side of the screen, there are displayed the values, which are input into calculator and which are displayed at the calculator dials (due to relatively low resolution of the front panel and low readability). 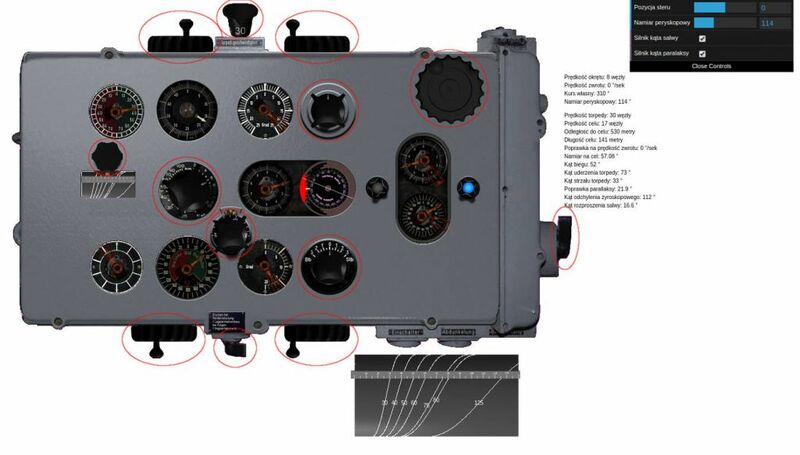 For the same reason, below the calculator front panel, there is located enlarged drum, which shows the maximum distance to the target in the moment of the torpedo launch. Then the target follow-up switch (Blauschalter) can be switched to synchronize the current target bearing entered into the calculator with the periscope bearing (and keeping them aligned). Then the component for calculating the current angle on the bow can be switched on by means of the switch (Lage Laufend). Now the change of the angle on the bow can be observed, when the target bearing is changing. It should be remembered, that manual adjustments of the angle on the bow (by means of the knob) can be done only when the component for calculating the current angle on the bow is disabled - otherwise this block will compensate these adjustments. The panel located in the upper, right corner of the screen contains also two checkboxes. These checkboxes can disable electric motors of the components for calculating the parallax correction and spread angle. After disabling these motors, the knobs can be used for calculating the parallax correction and spread angle. When these motors are enabled, all manual corrections are compensated and removed automatically. The slider for setting the deflection of the main rudder, the U-Boat turn can be simulated. In such case, the turning speed correction can be applied and the influence of the course change (and change of target bearing) for operation of the component for calculating the current angle on the bow can be observed.